Our intel sources have identified his evil lab, but unfortunately the access seems restricted to his staff only. Can you help us save the Pyzza? 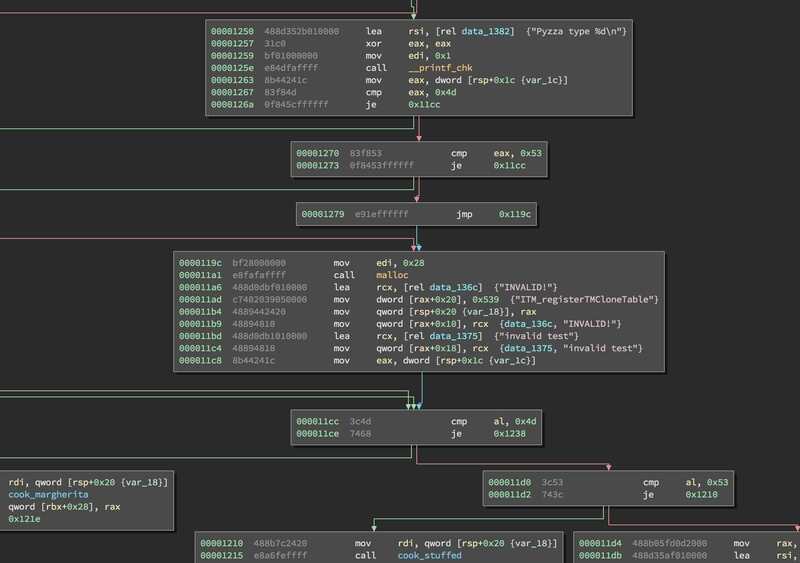 This was a great challenge involving a bunch of different techniques and styles all combined into the one task, from SQLi to reverse engineering. A quick look forrobots.txt and other default files revealed nothing of interest, but cookies being returned included AWSALB indicating the app was behind a load balancer and a pySess indicating a python app. If the filter is based on IP it might be possible to bypass it with an X-Forwarded-For header. Nice we’re onto something! @corb3nik from my team OpenToAll then discovered that the header was vulnerable to an SQL injection. Great! We now have access to the main site and can start ordering pizzas. Decoding this results in what looks like some base64 data followed by a hash, which looks suspiciously like it could be hmac. After downloading and inspecting all of these, they are compiled python modules that we can import directly in python. The Cuoco class has a some interesting methods including cook, get_secret, and get_last_order. get_secret returns !DUMMY__SECRET! (which is hardcoded in the binary), so I assumed that the server version would have this modified to the real secret which is used to calculate the HMAC. The pyzza cookie contained a type at the start, either S or M, and I notice that this could be changed without invalidating the HMAC. This allowed us to cook a margherita, but have the status page display it as a stuffed pizza. So we have an arbitrary read when cooking a Margherita pizza as Stuffed, but there is a slight problem in that we need to know the order code to be able to check the pizza’s status from the web site. We can get around this by brute forcing the order code one byte at a time, but the other problem is that we have no idea where the secret is in memory as it’s part of cuoco.so and due to ASLR could be anywhere. The other interesting things are we have a heap leak from Stuffed as Margherita, and a pointer leak of bbbb from Error as Margherita. Looking at the cook method in a bit more detail in Binary Ninja, we see at 0x1270 that if eax doesn’t equal 0x4d or 0x53 then an error is created with INVALID and invalid test. But then at 0x11cc only al is compared when choosing how to cook the pizza, so if we supply a pizza type of 0x1000004d we can get it to cook an error as a Margherita pizza. This will mean that get_last_order will return an order of invalid test and leavening will be the location of INVALID!. Looking at the location of !DUMMY__SECRET! in the binary, is only 0x44 bytes away! 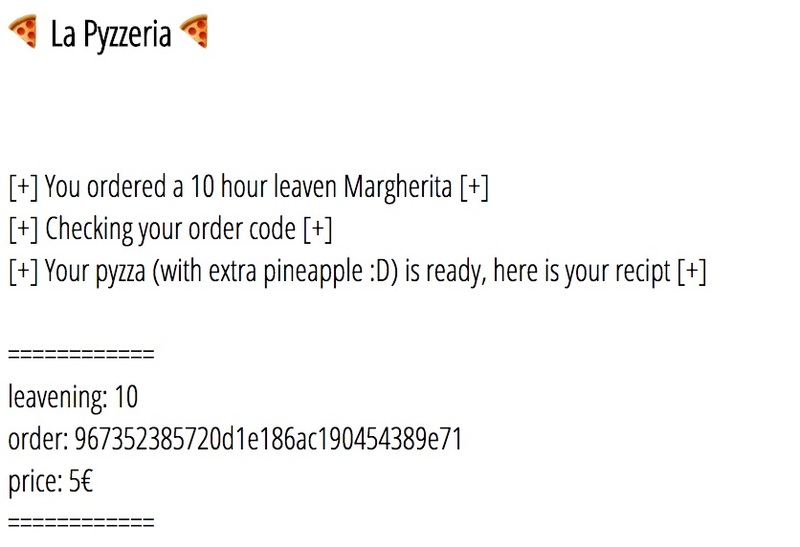 I wrote quick python script to create a pizza, change the type to our large M, and submit it to cook. I also set the AWSALB cookie to try to ensure that I hit the same app server each time. "X-Forwarded-For": "127.0.0.1 ' OR 1=1 -- "
Which returned a leaving time of 140188021826412! Now we can use the leak from cooking a Margherita as Stuffed to extract the secret one character at a time. I started off testing just the last letter to see if it was the same as the dummy password, and it was! Summiting a ! successfully returned the order, but trying Y! as the last two characters did not work, so brute forcing time. At this stage I didn’t realise that the connection throttling could be bypassed by modifying the X-Forwarded-For header, so I just paused for 5 seconds between each request and left it running. After a while it had found 0y3y0y3! as the end of the secret so I changed the search characters to just 0y3 and it finished much faster. We now have the secret key y3y0y3y0y3y0y3! Success! Final step is to use pickle to get RCE. I first tried with a simple sleep to see if the request waited 10 seconds before returning, which it did. But then I couldn’t get any reverse shell working, it would just hang or error out. I thought maybe outgoing network connections were being blocked, but a simple wget to my webserver got through successfully. Perhaps only port 80 is allowed? "X-Forwarded-For": "127.0.0.2 ' OR 1=1 --"